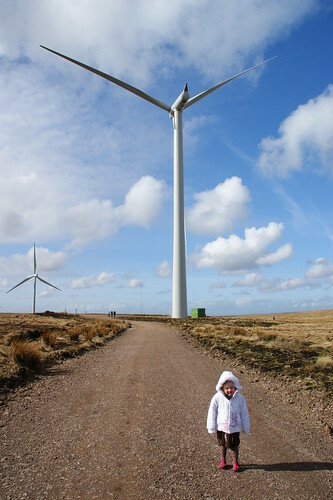 Yesterday mummy and daddy took us to see millions of windmills on a hill near our house. They were really, really tall. It was a nice place to walk, though they were very far apart for someone with little legs like mine. I am glad I was wearing my ski jacket because it was a very cold place. After mummy put her photos on flickr their friend Stewart - the nice man who left Collins so daddy could get a job there and meet mummy - told us that the windmills on the hill are from Denmark. Isn't that nice?